Whole Lot of Shakin’ NOT Going On! Last weekend my friend Mike Freiberg, Nikon's Birding Market Specialist, invited me to join him for some digiscoping tests on Nikon's latest scope offering, the 85mm EDG VR Fieldscope. What makes the scope really interesting to me is the VR part- it stands for Vibration Reduction, Nikon's image stabilization system (similar to Canon's IS, Panasonic's O.I.S., etc.) 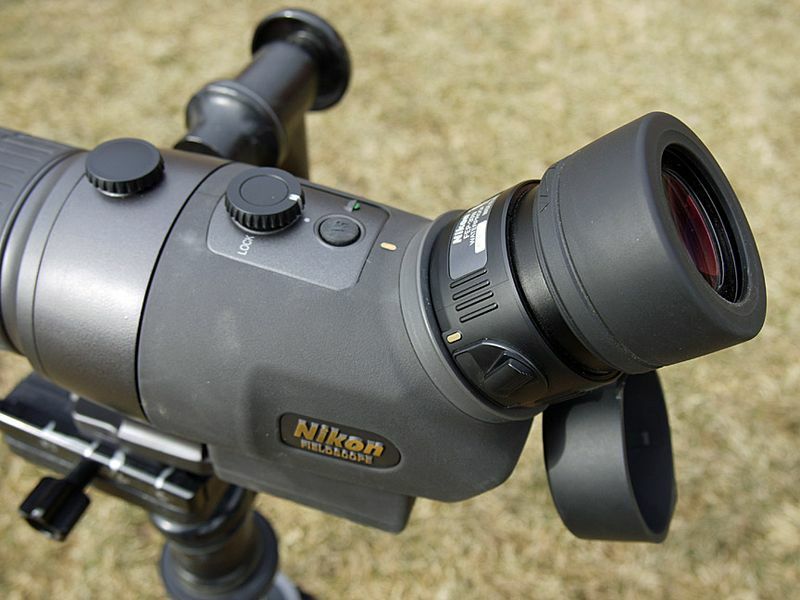 Essentially, Nikon took the VR mechanism found in their camera lenses and put it into a high-end spotting scope. Nikon 85mm EDG VR. The boxy part behind the scope mount is the compartment for 4 AA batteries. VR controls on top in front of the eyepiece. Green light = VR on! There is also a lock-out so you won't inadvertently run the batts down when the scope isn't in use. After trying the rig out I can say that the VR really made a noticeable difference. I digiscoped many subjects to see how it worked, including challenging situations such as moving birds or skulkers in low light. My conclusion is that the VR truly eliminated most of the blur-inducing shake that is the bane of digiscoping. Below are some examples I obtained by hand-holding my Panasonic DMC-G1 body /Olympus 14-42mm f/3.5-5.6 14-42mm II R Lens combo to the scope, which had a 30X wide eyepiece mounted. I imagine that results would be even better with a digisoping mount instead of just hand-holding the camera. 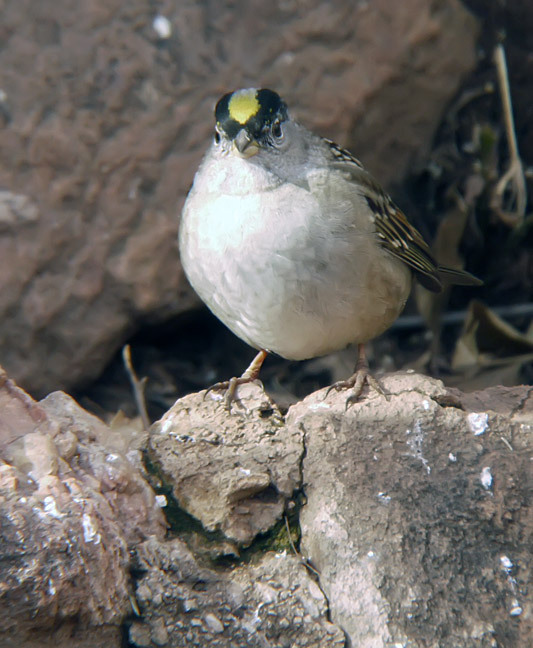 Golden-crowned Sparrow, Red Rocks Park, Morrison, CO 7 Jan 2012. This regional rarity is delighting birders for a second consecutive winter, but likes to lurk back in the bushes & shadows. At ISO 400 I was only getting 1/125 second shutter speed but still got a nice shot despite hand-holding my camera rig to the scope's eyepiece. 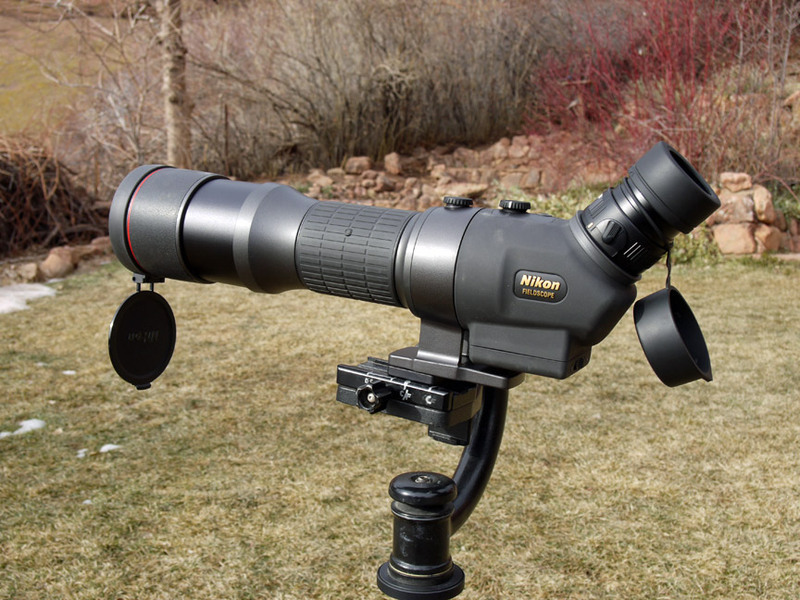 Mike Freiberg had his scope rigged with a Nikon DSLR adapter and shot this video to show the effect of activating the VR during some windy digiscoping. Ride out the shaky stuff at the beginning- it is worth the wait to see how the VR cancels out most vibration when he activates the feature towards the end of the short video. 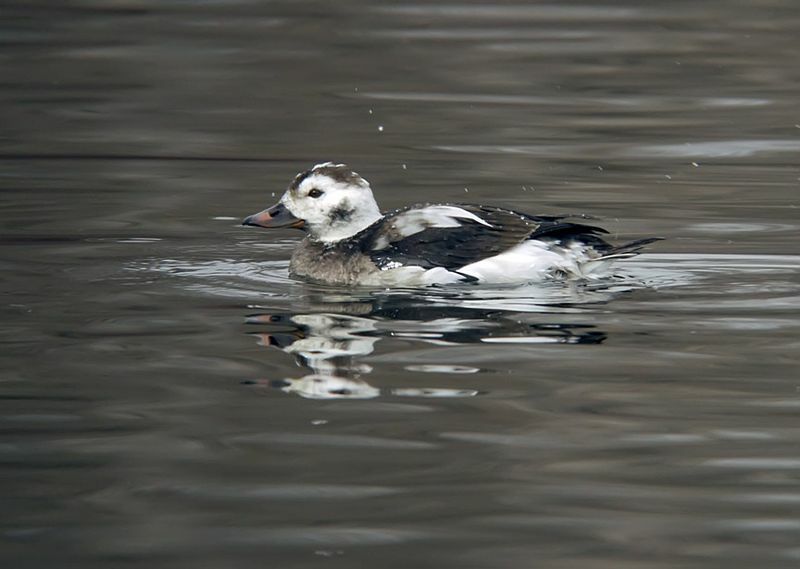 In summary, the advantages of adding image stabilization to a scope include a much better image when viewing in windy conditions or when tracking moving birds. It is also a huge advantage when digisocoping, as the technique notoriously magnifies any problems with scope movement or vibration, particularly when slower shutter speeds are dictated by less-than ideal light. Camera lens stabilizing doesn't help the problem as the scope is acting as the primary lens, but this finally puts the VR where it is needed. I think it will be very interesting to see how this technology is received by birders & wildlife aficionados, and if image stabilizing will find its way into other manufacturers' lines.